Fairy Tale by Oscar Wilde adapted by Amanda Holden for Narrator (actor), GIANT (actor), Children’s Choruses, Percussion Group, Flute Group and Chamber Orchestra. Amanda Holden’s libretto, based on the fairy tale by Oscar Wilde, was commissioned by Islington Eduction and first performed at the Union Chapel in Compton Terrace, London N1 in 1997. The composer was Jay Anthony Gach and the production was directed by Matthias Janser. 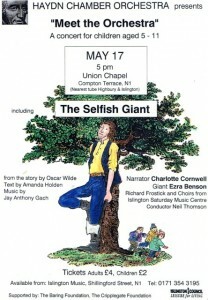 The Selfish Giant is suitable for full or semi-staging. Every afternoon, when school finished, the children used to go and play in the GIANT’s garden. … the grass is soft and green. How happy we are today! I wish we could always stay. until the end of every day. One day the GIANT came back. ..